Monterey Jack, a cheese which is relatively unknown here in Québec, is nonetheless a perfect partner for your everyday dishes. Just like Brick, St. Guillaume Monterey Jack is much tastier and practical to use than the more traditional Mozzarella. Do you want to add a more exotic flair to your everyday meals? Use St-Guillaume Monterey Jack and you’ll see, your dishes will only get better and better! Semi firm cheese, lactose-free and made from pasteurized milk. This cheese has no rind, its texture is very even and supple. Monterey Jack has a mild taste, slightly acidic, with a slight hint of hazelnut. There are many ways that you can enjoy this cheese; Monterey Jack is extremely versatile! Enjoy it in little triangular-shaped pieces or sliced… or in a cheese platter. Monterey Jack is also known to go well with “au gratin” dishes or grated with Mexican food. Slip a slice of Monterey Jack into your next hamburger: It will make you feel like you’re at the restaurant! It is recommended to let Monterey Jack stand at room temperature for 2 hours before consuming. 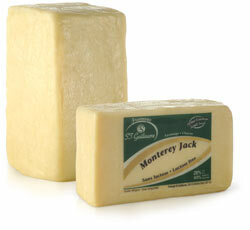 Monterey Jack must be refrigerated and can be kept for up to 3 months from its original date of packaging.